My students at ZEE Institute (ZICA Hyderabad) is moving ahead way faster than I thought. Even though we moved to another module in our Digital Marketing Course, I asked them to keep writing blogs to nurture the writing. So, here is another blog by the title ‘How to Prepare Angel Cake without Fat’. That’s something even I shall read as I am a fitness freak myself ;). Related Link: Prepare Mik Bread Traditionally, Easiest method. Read till the end and share your views in the comment section. I am writing this blog to share a homemade angel food cake. When I consumed this cake It was very smooth in texture and sweet in taste. I love angel cake because it includes only egg white without yolk(which contains fat). 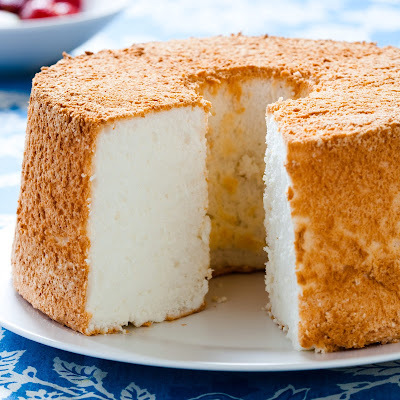 Angel food cake involves whipping of egg whites to give a smooth consistency to the cake. I decided you to provide a homemade angel food cake in an easy way and in a palatable way. We all know that in industries they add preservatives and color additives which leads to other diseases. Here we want to know more about the ingredients used for the angel food cake. Take a look at the ingredients which is useful for you. Now here I provide you directions for making homemade angel food cake. 1. First, take a bowl and beat egg whites until they form stiff peaks. 2. Add Cream of tartar and Vanilla Extract to the whipped egg whites. 3. Sieve Flour, Sugar and Salt in another bowl. 4. Now combine the egg whites with the dry ingredients and mix gently as a dough. 5. Turn on the oven before placing the oven in the oven and set it to 165C. 6. Now grease the pan with oil or ghee and dusted with flour and place the dough in the cake pan. 7. Keep aside for 10 mins to raise the dough in the pan. 8. Now place the cake pan in oven for 1 hour until golden brown color appears. 9. Invert cake and allow it to cool in the pan. 10. When thoroughly cooled the pan remove from the pan and use toppings if needed. Conclusion: Readers! I hope you get some information on this blog for preparing homemade angel food cake which is rich in nutrients, vitamins, and no fat. The fatless cake is very useful to the people who are in the diet. It also increases nutritional value. If we take a daily intake of 1 slice it gives 297 calories. Drop a comment for any suggestions. If you loved this blog, learn how to write from me ;). India Lift the Under19 World Cup ~ Here’s how people praised Men in Blue on twitter. He sells tea for a living but that didn’t stop him from taking his wife on 18 honeymoons! We are an Internet Media Company for the online Users around the world. We create or publish content created on different categories mentioned on our website with sole intent of helping it reach as many of us as possible.